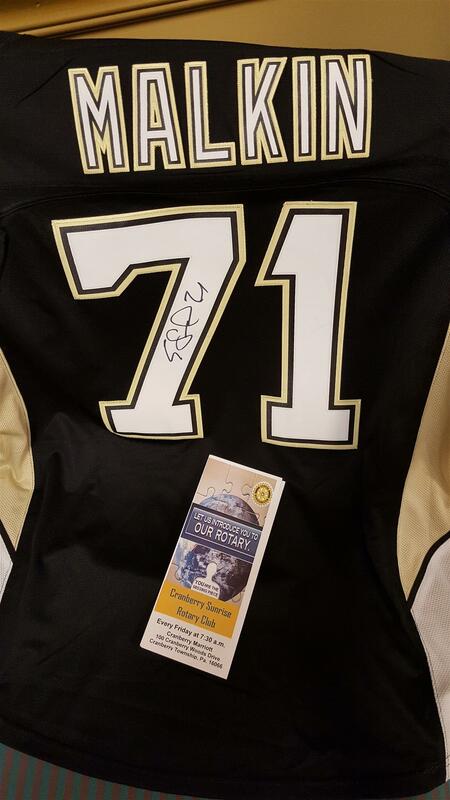 Since our Golf Outing got rained out last Friday, we are going to auction off the autographed Malkin jersey. One bid and one bid only per person, your bid is last and final, make it high because you don't get a second chance. Email your bid to me,vconrad@pinnaclestrategies.org and again, one bid and one bid only. Deadline for this bid is 4pm EST on Thursday, May 18, 2017. Any bids received after 4pm EST Thursday, May 18, 2017 will not be accepted, there is no reason to delay getting your bid to me. If there is a tie for the highest bid, I will contact only those individuals who are tied, via email, and give them the opportunity to make one, last final bid in order to try to break the tie. If after this tie breaking bid we still have a tie, those tied will have their names put into a hat and the name drawn from the hat will be deemed as the highest bidder.